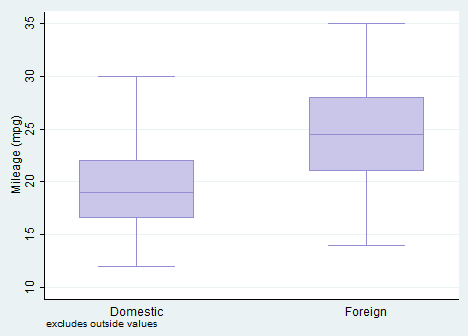 Anytime you want to check if you are approaching the problem, just display graphs and tables on Stata. I hope that you are enjoying your Sunday afternoon and that you find your comfortably way out of your Stata dilemmas. Today we are going to play a bit with graphs and tables (in the second part). 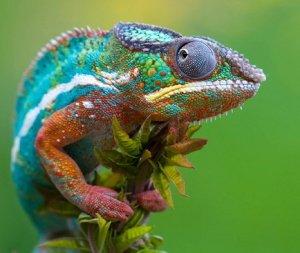 I will show you several helpful commands to present your data in a professional way. We will talk about several commands and ways of combining what we already learnt. Let’s start from the usual and friendly auto.dta! 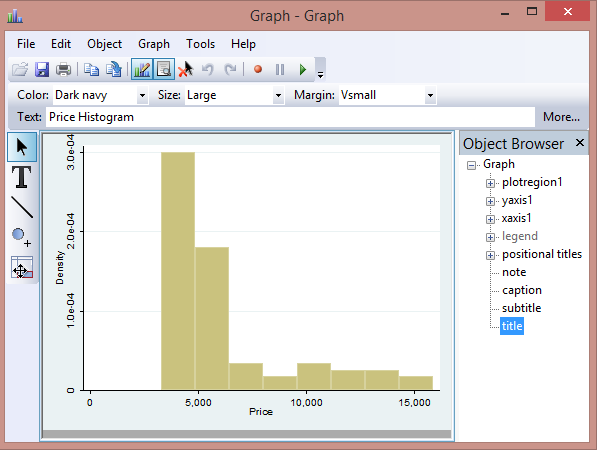 We can choose through different kind of graphs in Stata. The common ones are histograms and scatterplots but we will study also boxplots in order to gain a comprehensive understanding of every disposable tool. We get a simple histogram of the variable selected. If you are interested in other magic stuff offered by this command, remember to use the help histogram. 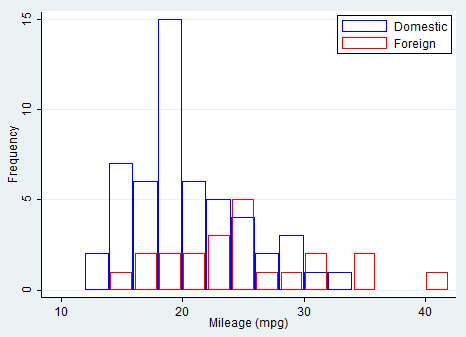 In this case, I asked Stata to show the frequency distribution of mileage divided by car type and in its entirety. Otherwise, you can delight yourself using a bit of programming and set all the characteristics your graph must have. Your task is to play with it! Learning by Doing is my personal slogan; use it to improve your skills. If you will have the patience to play a bit with the options Stata offers you, you will admit that any graph constructed with Excel can be obtained with a simple line of coding. 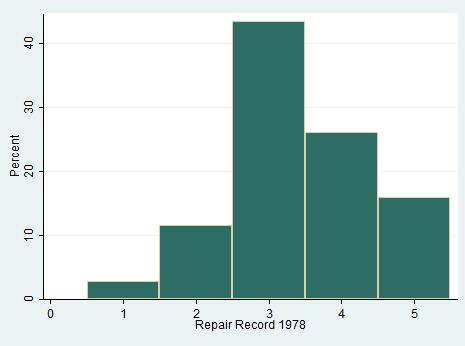 I also mentioned you could combine graphs for more than one variable. 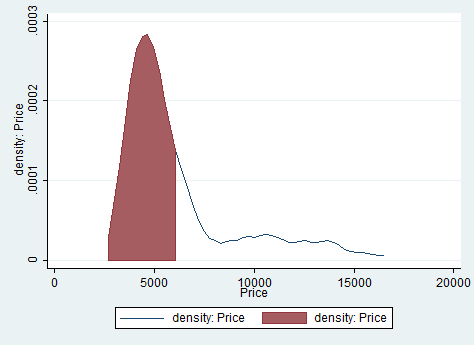 Kdensity allows you to do it but the command syntax is not that easy as it is for histograms. 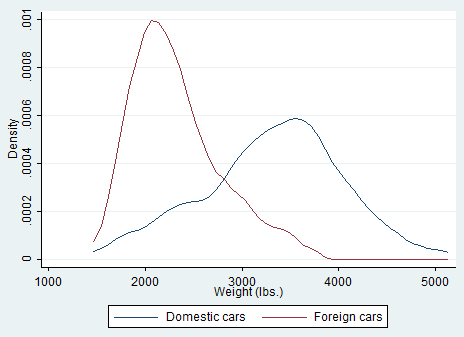 I asked Stata to show me the boxplot of mpg dependent on the car type in the same graph area and without outliers (noout). The boxplot support either the option by() or the option over(). I suggest you to check them out with the help command. 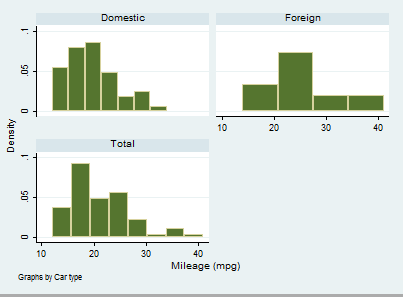 The over option creates a pie chart representing the frequency of each group of Car type. 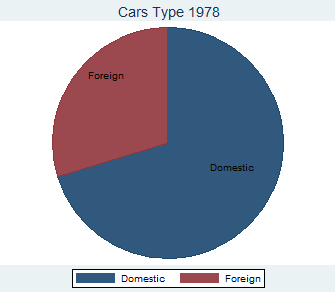 The plabel option places the value labels for Car type inside each slice of the pie chart. If you did not previously generated them, you can easily modify them after using the Graph Editor. 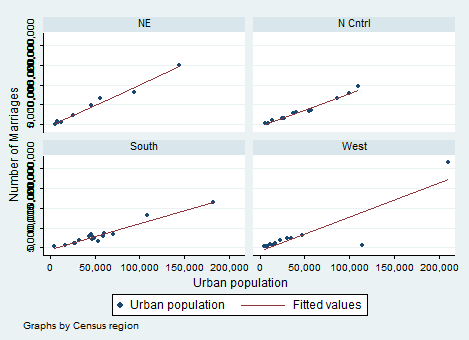 A two way scatter plot can be used to show the relationship between variables. 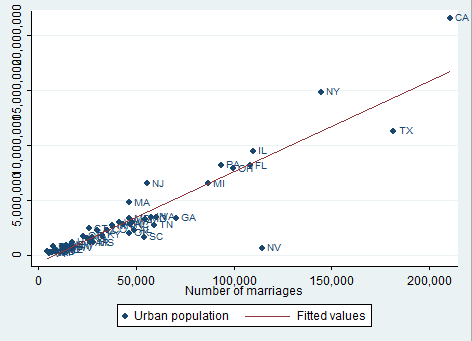 Let’s open the example dataset census.dta and study the relationship among the urban population and the number of marriages accounting for every different regions. By doing so we can easily identify outliers. If you do not like the marker label position you can also change it with the mlabangle() option included in scatter after mlabel. Finally, we can request confidence bands around the predicted values replacing lfit with lfitci. 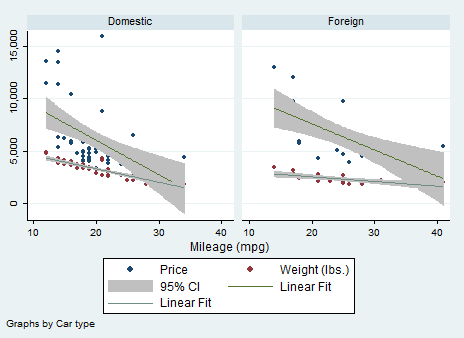 Here I told Stata to regress price and weight on mileage, include the confidence bands, divide the sample by Car Type and change the names displayed in the legend. Usually, at position 4 and five you can find “Fitted Values”. I personally dislike them so I changed them! The graph name is now scatter. Unfortunately you cannot rename your graph with more than a word like “That’s cool” but I know that, right now, you are feeling powerful due to all you have learnt. 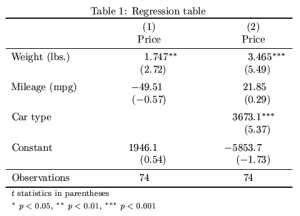 In the next post, I will explain you the basics of regressions and I will come back on graphs to show you Regression Fit Plots. Quantile, qnorm and pnorm are different useful graphs you can use if you want to investigate if your variable has, for example, a standardized normal probability plot. Having added them, we can consider our tour around graphs finished for today. I expect you to talk about Tables!